According the Ventura Agriculture Commissioner's 2014 Crop Report strawberries are the leading agricultural commodity in Ventura County, with a value of $628,000,000. UCCE Ventura conducts collaborative research and outreach in strawberry with emphasis on sustainable production and pest and pathogen management. Recent Meetings and Videos: These webpages provide links to presentations, meetings and video content given by UCCE Ventura related to strawberry. Presentations, some with audio, allow the public to review the information presented in the meeting at their own pace. 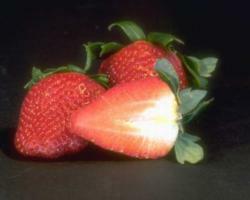 Diseases: Here information on research and disease threats to strawberry is presented. Fumigants: UCCE Ventura has devoted research to fumigant treatments and alternatives, an area of increasing importance as restrictions and concerns about some treatments on strawberry and other crops affects grower practices. An updated version of Fungicide Efficacy is also available online: 2015 Fungicide Efficacy . Production: Keeping strawberry a viable crop in the county is important to our research and education outreach to growers and the public. Insects: UCCE provides updates and research on insects, both beneficial and destructive, that affect can strawberry production. Other Pests: This information addresses other pest issues not related to insects. Water: Irrigation, water use and water quality issues are important to strawberry production particularly in drought prone Southern California. The meetings presented here focuses on water related areas. Weeds: Information on controlling weeds in strawberry fields is presented here. Strawberry Disorders Website: Check out this cooperative effort from UC strawberry experts designed to assist growers and pest control advisors identify a variety of disorders found in strawberry. Information is presented in both English and Spanish. Water Quality Resources: A comprehensive list of water related resources for growers in Ventura County only and Ventura and the Central Coast are found on these pages.